Anyway, for this post I want to briefly summarize another aspect of R (or most programming languages for that matter) that is quite powerful: automating data processing and/or computational tasks that need to be done for multiple files. This funny graphic* below was going around some months ago and very nicely illustrates what I’m talking about. Okay, back to data processing with R. The particle size instrument we use to make the measurement outputs a standard text (ASCII) file with some header information and two columns of data: particle diameter and relative mass %. From these two columns of data we want to calculate the mean particle diameter from a subset of the entire range. If I had only a handful of files, I would end up doing something like this: Import .txt file into Excel > build formulas to calculate what we want to calculate > copy resultant value to another spreadsheet, and then repeat for each file. On the graphic above, this would be doing it ‘manually’. First thing to do (after setting the working directory) is to define the function we want to apply to the data files. In this case, we need to calculate the mean from relative frequency data. Remember, any text with a ‘#’ before it in these examples of R code are just notes to remind myself what the code does. Next step is to import the text files into R. The way it’s written here you need to make sure the files are in the working directory. This will bring in all files that have a ‘.TXT’ in the file name. Now, here’s the cool part. The code below is a loop that does a few things. First, we tell R to skip the first 15 rows of the text files. These rows contain header information that is unnecessary for our purposes. Second, it creates a subset of the data. In this case I want to make the calculation only on the 10-63 micron range. Because 63 microns is the max (samples were sieved at 63 microns prior to analysis) we tell R to create a subset of all data that is >9.99 in the first column. Third, we provide names for the two columns (‘diam’ and ‘freq’) that correspond with the function above. I suppose you wouldn’t have to name the columns, but I like to be able to just look at this code and know what it’s doing. Finally, it applies the function ‘meanSS’ that we defined above. This is all within a ‘for’ loop command such that it applies these steps to every text file that was imported. I had been stuck on this loop code for some time. I spent several cumulative hours over a couple weeks on websites like Stack Overflow searching for tips and trying out different things, but couldn’t quite get it to work. Thankfully, I was able to get help from this fantastic service on campus called LISA (Laboratory for Interdisciplinary Statistical Analysis). One of the stats department grad students working at LISA fixed my nearly-working code in about five minutes over email. Awesome! Next, the results of the above calculation, which in this case is a single number, is put into it’s own vector in R. ‘Printing’ the results simply displays the calculated values on the screen. I’ve only generated a few text files so far, we have a lot of sample preparation work to do before we get to generating these text files. But, it was pretty satisfying to open up R, highlight the code, hit run, and see the values from multiple files appear in seconds. Future additions to this code will be to create time series plots of the calculated values by merging with a table of age data. And, ultimately, we’ll want to create time series plots of these data combined with time series data generated by other scientists from Expedition 342 (e.g., oxygen isotopes). To summarize, the processing and calculation steps in this code are not complicated, they are rather simple. But, the ability to loop those simple steps and automatically apply to numerous text files with a few key strokes is powerful. If anyone has any tips to improve this code, I’d love to hear it. 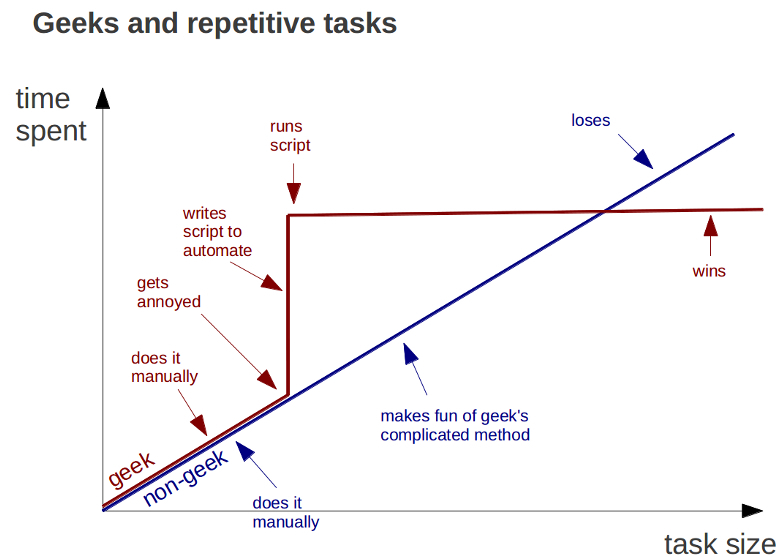 * As far as I can tell, it looks like the ‘Geeks and Repetitive Tasks’ graph came from Bruno Oliveira’s G+ page. Thanks for the link to the McCave and Hall paper – looks interesting. Are you guys running any oxygen isotopes in your lab? No, not running any isotope measurements here. About half the science party from this expedition are measuring isotopes of one kind or another. Some data sets are not amenable to manual analysis, the ONLY practical method is using compuer-aided analysis. The example shown is a good example of a learning scenario – data set to get your brain around but large enough to make the automated analysis productive. I wish I were familiar with R, I would love to consult just for the fun of participating in actual research. Yes, the guy who helped me out noted it was important to define the function at the top and outside of the loop. Don’t feel bad about not knowing R … this little bit of R is the *only* programming/coding I know. Sum_Freq = Sum_Freq + freq(i). my formating was removed from my original post too, I wish that “extra” spaces, etc. weren’t automatically removed. Thank you for you post! I did some practice following your post. But there is a question I want to ask. I have two .txt files, lets say. There are two rows and two columns values in each file. It seems only the first row did the function and output. What about the second row if I also want them to do the function? ?